There is a part of Paris where Sarah Bernhardt and Jean Mounet Sully are forever united. Two of the most famous actors of their era, the pair were often partners on stage and said to be lovers behind the scenes. They died within 7 years of each other, and less than 20 years later, the city of Paris had placed them side by side in a corner of the 20th Arrondissement. A park for Bernhardt, and laying down beside her, a street for Mounet Sully. Passionate characters on stage, the two now abide in an area of commendable harmony. The Square Sarah Bernhardt and her surrounding streets of admirers form part of a kind of 1930s theme park, a homogeneous blend of natural greens and brick reds with faint touches of curved concrete greys. Whilst paying respects to giants of a previous age, this district also provides a vision of a society that thought it had found answers to past problems. We didn't listen to the visionaries then and it's probable that we never will. 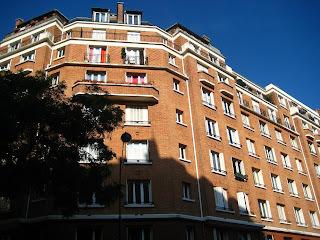 Like an ageing actress, the Square Sarah Berhardt remains elegant but has lost the éclat of youth. It still provides a haven for local families, with sheltered corners for those wanting tranquillity and a giant, sandy play area for the kids with energy to burn up. 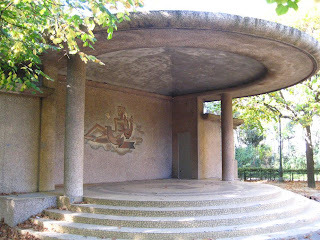 What makes it stand out from other parks in Paris however are the modernist structures scattered around that seem to serve no purpose today. On one, a neo-classical mosaic of a deity playing a harp provides a link back to the recurrent artistic and pastoral theme of the quarter, but others are simply empty shells. As forms though, they provide a wonderful counterpoint to the surrounding buildings. 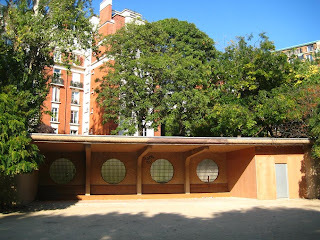 Outside the park are several brick constructions, known generally in France as ilots. These were the stadia overlooking the greenery, and housed the emerging Parisian middle-classes. 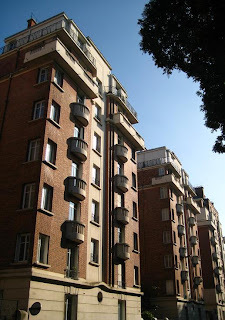 Constructed in the decade Huxley introduced us to his nightmare vision of the future and Orwell published his account of a recent down and out past, these were the buildings that would lead Parisians from squalor towards a future of serenity and equality. Influenced by art deco forms, they point nevertheless towards a modernist future. These were homes as 'machines', bringing objects of modern production, such as electricity and telephones into daily life. On the edge of industrial areas to the north and east, these blocks were designed with certain themes in mind. Inhabitants should have larger, more salubrious living areas, access to the latest gadgets and be surrounded by greenery and artistic symbology. In essence, these were homes for the Betas, designed to make people like their unescapable social destiny. In reality, it was the end of a golden age of architecture and the vision was largely rendered irrelevant by economic depressions, continuing poverty and a catastrophic global war. Architecture and urbanism provide the framework of our lives, but they cannot solve political problems. With today's economic climate, the spectre of the 1930s is being mentioned again, but what have we actually learned since then? All we have established is that great art and wonderful buildings stand firm whilst economists and politicians are purely ephemeral. Do you know why Sarah got her square here? Obvioulsy far away form theatres where she played and also from where she lived (17th)? She was born in Paris. In this area? I'm not sure Peter, but I imagine it was simply because this was one of the major redevelopment areas at the time, with very little develomment space being available in her more familiar haunts. Given the fact that the surrounding streets (constructed at the same time) also have artists names, I think they were trying to create an area that celebrated the arts. She did lead a fascinating life though, but I didn't know that she had lived in the 17th, but apparently she was born in the 5th.